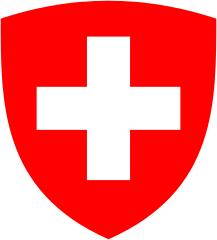 WARNING: The Swiss coat of arms has special legal protection in the United States (US Code Title 18, Part I, Chapter 33, § 708) and other countries. This is unlikely to affect its use in Wikimedia projects; this special protection is required by the w:Geneva Conventions to avoid confusion with the w:Red Cross emblem (a color reversal of the Swiss emblem). 当前 2010年2月15日 (一) 20:32 604 × 669（291字节） Zscout370 I received another copy of the Swiss Government design manual; they stated for online use, the arms and flag must be #ff0000. 2006年5月24日 (三) 07:49 604 × 669（486字节） -xfi- I have added 2 px on sides, same colors, same licensing. 2006年5月22日 (一) 16:48 595 × 658（967字节） Perconte~commonswiki kor.